Since map programs with satellite images took the world by storm in 2005, aerial photography has become crucial to everyone from firefighters to real estate tax assessors. It was acts of terrorism and natural disasters that highlighted the usefulness of aerial imagery, along with increased research and spending in the name of Homeland Security. 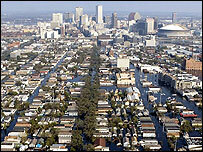 Hurricane Katrina proved an ideal opportunity for rescuers to use before and after photos to understand the layout of New Orleans. At Rochester's 911 emergency centre in New York State, operators can pull up an overhead map of the caller's location, and responding crews can be told lifesaving information as they approach the scene. Snow, for example, can make a firefighter's job challenging. "In the winter months our fire hydrants can be buried underneath a snowbank," explained John Merklinger, 911 director in Monroe County. "So being able to locate that hydrant, and tell them where to start digging to find it, can make a big difference on how fast they can uncover and use it." The system, supplied by Pictometry, produces multiple geo-referenced oblique images of any one location. This means locations can be viewed from every side, and each pixel has a GPS co-ordinate so the software can measure lengths, perimeters, distances and even elevation. 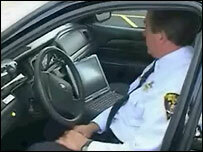 Police cruisers have put the system into their cars so that, for example, during a bank siege, snipers are able to quickly find the best vantage points, or predict the route of a runaway suspect. "Our version was designed to work with the touch screens, which obviously simplifies things like distance tools," said Major Neil Flood of Monroe County Sheriff's Office. "We can pretty quickly draw lines and figure out distances without having to use a mouse." So far so good, but what law enforcement officials would like to do is to be able to superimpose the GPS co-ordinates of their men and women onto the map - but that is the next stage. Another request is for the photographs to be updated more often, but cost constraints mean an area is usually photographed every two years. We can't see faces, we can't see number plates. That suits property tax collectors fine. They use software to spot new swimming pools or home extensions, and consequently in some places tax disputes have dropped by 75%. But there is a limit on how much detail is picked up from above. "We have found what we believe is just the right balance between being able to see the things we need to see to save lives, and not being able to invade privacy in any way," said Dante Pennacchia from Pictometry. "So we can't see faces, we can't see number plates, we can't identify a person. And we don't want to." The number of uses for aerial photography is almost endless. Combining information about underground pipes and cables with above-ground landmarks and obstacles is another example. Sewer repair crews have been cut from four people to two, thanks to laptops. Within minutes a person can work out how much of the area around a sewer might be flooded if one breaks, and send for appropriate backup. "The maps and the pictometry help us identify street familiarities - poles, hydrants, signs - that quickly get these guys to a location and allow them to do their job more expeditiously," said John Graham of Monroe County Environmental Services. The next generation of aerial photography provides 3D fly-throughs. It is enough to make even the new version of Flight Simulator seem old.